Cutting or trimming hair at home can save a lot of money over time. That said, using the right pair of clippers is essential if you want to look as good as you did when you left the barbershop. We researched some of the best-selling brands and highest-rated products to put together this list of hair clippers so you can find the right one for you. Before we get started, let’s look at some important features to consider. 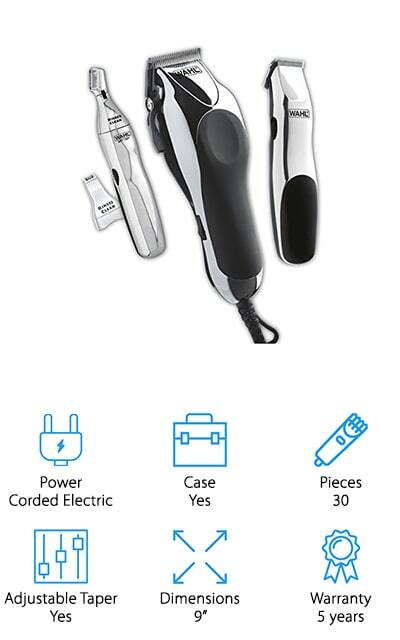 Power: Some of these clippers are corded while others run on rechargeable lithium-ion batteries. Check this out, though. A few of the battery-powered options can be used with the cord while they’re charging. Sort of the best of both worlds. Case: Having a case for these items is great, especially for those that include a lot of bonus attachments and extras. Being able to keep everything together in one place saves a lot of time hunting around for things later. Pieces: There’s a lot of variety here when it comes to what’s included with these products. We found everything from a clipper that doesn’t need combs to a 30-piece at home barber kit that has just about everything. Adjustable Taper: Some of these items have a small dial or thumb lever that adjusts the length of the blade. Adding different guide combs on top of that means you really have a lot of length options and adds versatility. Dimensions: This measurement is how long the body of the clippers is, from the end of the handle to the tip of the blade without any attachments. Note, the length of the power cord attachment is not included in this figure. Warranty: As with all things, warranties vary a bit. We found clippers that are covered for as a little as 90 days and one that’s good for a lifetime. The length of the average warranty is about 1 year. Now that you know more about what to look for, let’s move into our reviews. Here’s how it works. Our top and budget picks are at the top of the list. That’s the best place to start if you’re in a hurry because it gives you a good idea of the variety that’s out there. Whether you’re looking for the best clippers for black men or just want something simple to trim your beard, you’ll find it here. Okay, let’s get started. Our top pick is the Wahl Professional Magic Clip, the best professional men's hair clippers we found while doing our research. This product is from Wahl’s commercial grade line, designed for professionals who need sharp results. One of the cool things about these clippers is you can use them with or without the cord. Why? Because the charging cord is so long, it’s easy to use it while plugged in. This means you have the option to go cordless for 90 or more minutes per charge but a dead battery won’t stop you. The high-precision blades fast and easy to use and the taper level is perfect for fading and blending. This set includes the clippers, charger, 8 different comb attachments, a red blade guard, and the oil and cleaning brush for necessary maintenance. The best hair clippers for men on a budget are these clippers from Remington. 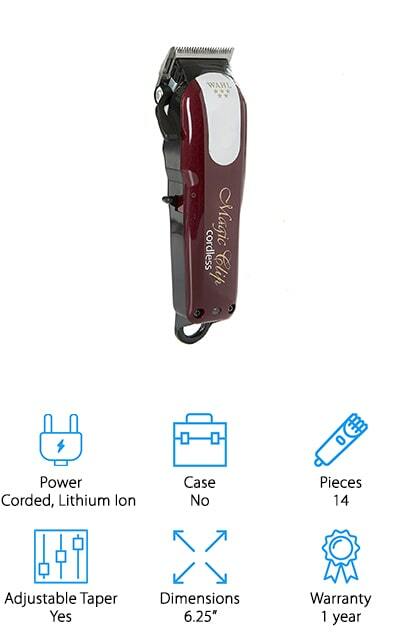 This is an awesome kit that includes 21 pieces, everything you need to cut and style your hair and maintain the clippers themselves. It comes with a variety of length adjusting combs, a beard brush, and comb, and oil to keep the blades protected. That’s not all, it even comes with a durable hard plastic case to keep everything together. The blades are precision ground so that they can go through even the thickest hair without snagging or pulling and the super torque motor cuts twice as fast as comparable products. These clippers are corded but because the cord is 8 feet long you have more than enough length to work with. One more thing, these Remington clippers come with a lifetime warranty. OSTER is a best brand of hair clippers for black men and the Pivot Motor Clipper is a great example of why. 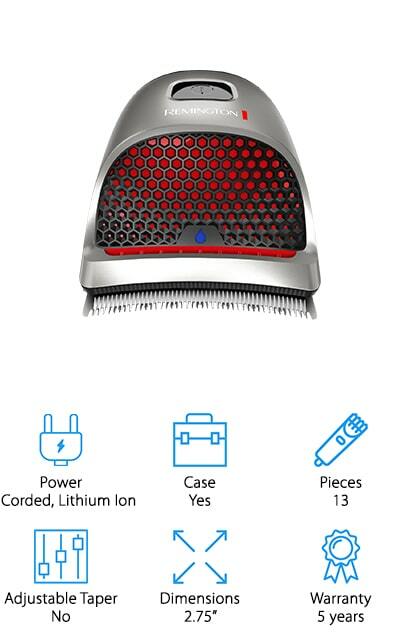 For one thing, it cuts through all hair types, wet or dry. It comes with 4 different guide combs including one for blending. The adjustable taper is easy to use and switches settings quickly between 000 and 1. That’s not all, the motor is powerful yet quiet and built for long-lasting performance. This is a great choice for professionals, too. The ergonomic design means you can cut hair all day without any pain or discomfort. Plus, it has a textured grip for superior control. This corded design has an 8 feet long cord so you have more than enough length to work with. One more thing, it includes oil and a cleaning brush for maintenance. Next up is the WARMLIFE Fade Clippers. This is a really great kit that includes a lot of extras. Here’s some of what’s included: a cleaning brush, 2 pairs of scissors, 2 lithium-ion batteries, a charger, and a storage bag. That’s not all, these clippers also have an adjustable taper that ranges from 0.8 to 2 mm. Add to that the 8 different attachment combs and you’re pretty much covered for just about any short haircut. The blade is made of titanium and won’t corrode or rust. There’s also a ceramic element that provides antibacterial properties. One of the best things about this product is the battery. On a full charge, it lasts up to 240 minutes. But don’t worry If the battery is flat. You can use it while it’s charging, too. If you’re looking for some good hair clippers for men but want something a little different, take a look at the Remington HC4250 Hair Clippers. What’s so unique about it? It fits right in the palm of your hand. This is a great feature for anyone who cuts their own hair. Why? Because getting the back of your head, neckline, and behind the ears is so much easier. The blades are made of precision ground stainless steel and go through even coarse, thick hair without pulling or snagging. It comes with 9 length combs and can cut from 1/16 to ⅝ inch. The battery runs for 40 minutes on a full charge but can also be used with the cord. Also included are a cleaning brush, oil, and a storage pouch. 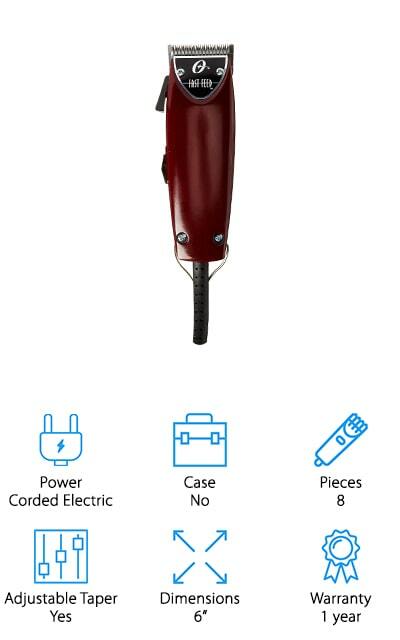 Andis Professional Fade Master Hair Clippers are a heavy-duty tool designed for professionals. The lightweight aluminum housing it really durable and lightweight so you can use it all day without any pain or discomfort. The adjustable taper is easily controlled with your thumb for fast and easy changes from 00000 to 000. In fact, it’s so adjustable that these clippers don’t even need attachable combs. Because it’s made of carbon steel, the blade is really durable and will hold its edge for a long time. That’s not all, the powerful motor runs at an impressive 14,000 strokes per minute while still remaining quiet, cool, and comfortable. One more thing, it’s corded for reliable, consistent power and has enough length so you’re not limited by having to be plugged into an outlet. 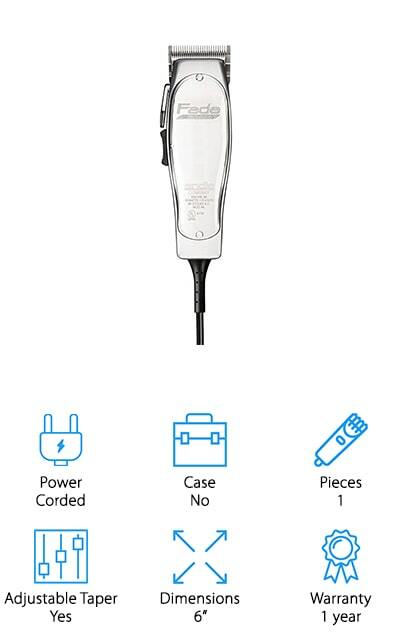 Our next pick is the Sminiker Professional Hair Clippers. The titanium blade won’t rust and keeps its edge to provide consistent and steady control. These clippers have an adjustable taper that adjusts from 0.8 to 2 mm and includes 6 guide combs ranging from 3 to 18 mm. Why does that matter? Because it gives you a lot of variety and makes these clippers great for a lot of different styles and haircuts. The motor is designed to operate with low vibrations which also has the benefit of making it ultra-quiet. It’s a great choice if you’re looking for something to cut kids’ hair. The lithium-ion battery charges fully in 2 to 3 hours and a full battery lasts for up to 8 hours. That’s enough time to give haircuts to your whole family! 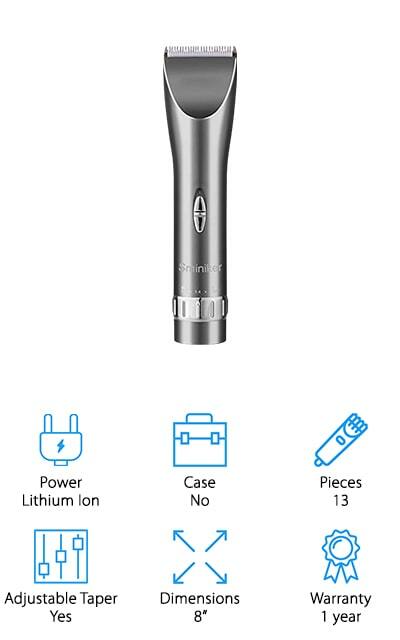 The Queetus Hair Clippers Electric Trimmer has a titanium and ceramic blade that holds its edge for a long time and won’t rust or corrode. This is a really versatile tool that has 3 different speed options so you can adjust for thick, medium, and thin hair. It also includes 6 different combs that range from 3 to 18 mm so you can use it for almost any short hairstyle. The charging dock is included and provides a full charge in 3 hours. A full battery lasts for about 5 hours. 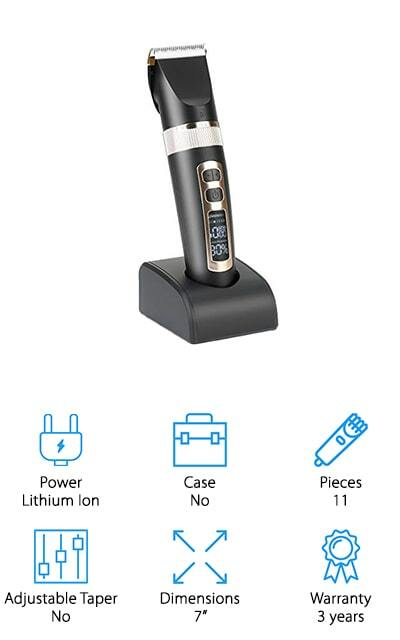 That’s not all, these clippers are really unique because they feature an LCD display that tells you the battery capacity and gives a recharge alert. It also tells you the rotating speed and lets you know when it’s time to oil. 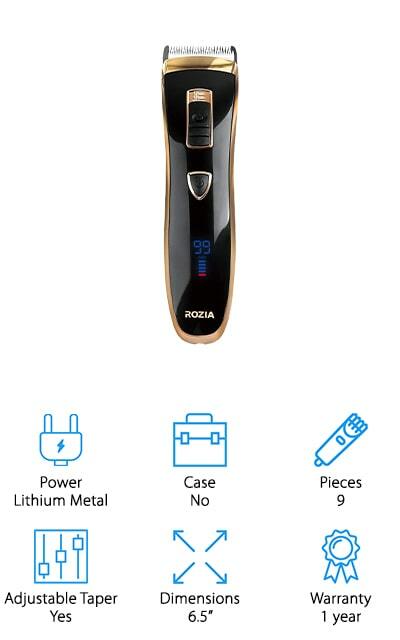 Next in our best hair clippers for men review are from ROZIA. It has a 4 stop adjustable taper and includes 4 different guide combs that are easy to use and can do everything from trimming to fading. The cut-angled ceramic and chromium steel blade moves easily through even thick hair. Get this, it’s also self-sharpening and won’t irritate your skin. The powerful motor runs quietly and is comfortable to hold onto. It also has a tapered design that’s easy to control and helps to avoid any discomfort or pain. These clippers also feature a digital display that shows you battery life so you know when it’s time to recharge. The included AC power adapter fully charges the battery in about 6 hours and a full battery lasts up to 2 hours. It also comes with a 1-year warranty. Another product in the running for best hair clippers for black men is the Wahl Home Barber Kit. This is a complete kit that includes everything you need for barbershop level haircuts at home. Get this, there are 30 pieces in all, including 12 guide combs ranging from ⅛ to 1-inch, comb, mirror, hair clips, and professional-quality scissors. 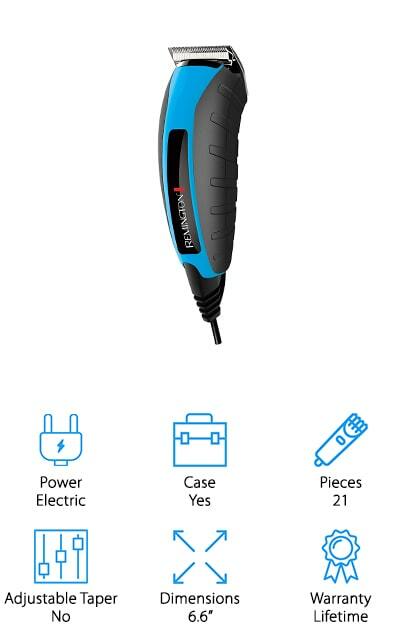 That’s not all, in addition to the clipper itself, you also get a small touch up trimmer and personal trimmer with 2 different head attachments. The blades are made of high-carbon steel. They self-sharped and hold an edge for a long time. Plus, you can use these clippers for a long time without any discomfort thanks to the ergonomically designed body. The clippers come with a 5-year warranty and the smaller trimmers are covered for 2 years.